Arnold Schwarzenegger as Harry Tasker in True Lies, released in July, 1994. Arnold Schwarzenegger is another great figure of Hollywood filmmaking. Made famous for his body-building, Ah-nold has lept from film to film, always delighting audiences just by being himself. Arnold's father Gustav had been a non-commissioned officer in the German army of occupation since the anschluss of March, 1938. After being drummed out in 1943 for having malaria, Gustav married, at age 38, Aurelia Jadrny in October, 1947. She was 23. The family was Roman Catholic and very strict. Gustav was a policeman. Growing up, Arnold felt that Gustav did not care for him; that he prferred his older brother Meinhard. Arnold was close to his mother her entire life. He was an average student, but won people over with his charming, sunny personality. After tying out various sports, Arnold decided on weight training at the age of 14. He began training at a gym in nearby Graz, where there were cinemas where he would see the films of Steve Reeves and other bodybuilder / actors. His parents wanted Arnold to conform to standard behavior, but the young man vowed to move away as soon as he could. Serving a compulsory year in the Austrian Army in 1965, 18-year-old Arnold went AWOL to compete and win the Junior Mr. Europe contest. Travelling to London for the 1966 Mr. Universe contest, Arnold finished second behind American Chester Yorton. A judge at the contest, Charles Bennett, offered to train Arnold, who moved to London to do so — and to learn English. He won the Mr. Universe title in 1967. He could lift a 500 pound stone. Moving to the U.S. in 1968, Arnold began training at Gold's Gym in Venice, California. He began to call himself "Arnold Strong" and it was under this name that he appeared in his first film Hercules in New York (released in February, 1970). Arnold would win the Mr. Olympia title in New York in September, 1970; he would win it another six times. In no time at all, Arnold came to dominate the "Golden Age" of professional body building. Arnold's brother Meinhard died while drunk driving in May, 1971; father Gustav died of a stroke in December, 1972. Arnold did not attend either funeral. Director Bob Rafelson would make a film of bodybuilding journalist Charles Gaines' novel Stay Hungry (released in April, 1976), with Jeff Bridges. Arnold won much attention from this movie. It is a charmer — see it if you can. Gaines helped work on the documentary Pumping Iron (released in January, 1977), which really brought Schwarzenegger to the movie-going public's attention. With this newly-found profile, he guest starred on The Streets of San Francisco aired on ABC in May, 1977, with Karl Malden — naturally. During this period, Schwarzenegger wrote articles for various bodybuilding magazines. He published his first autobiography / weight training guide Arnold: The Education of a Bodybuilder, which became a hot seller. After playing bodybuilder / actor / husband Mickey Hargitay inThe Jane Mansfeild Story with Loni Anderson in the titular role, aired over CBS in October, 1980, Arnold starred in his first big action movie: Conan the Barbarian (released in May, 1982), with James Earl Jones. It did well enough to warrant a sequel only two years later, Conan the Destroyer (released in June, 1984), with Grace Jones. Director James Cameron knew exactly what to do with Arnold's odd screen image: have him play a cyborg. The Terminator (released in October, 1984), with Linda Hamilton, became the sleeper hit of the year. Schwatzenegger was such a fun-loving badass, the studio sent out his next action picture, Commando (released in October, 1985), with the tagline: "Let's Party!" The no-brainer action film was born. Predator (released in June, 1987), with Carl Weathers, continued this pattern. Director Ivan Reitman saw something different in Schwarzenner; a gift for comedy. Twins (released in December, 1988), with Danny DeVito, became the first of several films the team made. Arnold got $10 million and 15% of the gross for Total Recall (released in June, 1990), with Sharon Stone, then did Kindergarten Cop (released in December, 1990), with Reitman. But Arnold Schwarzenegger's true masterpiece is Terminator 2: Judgement Day (released in July, 1991), again with Linda Hamilton. The scale of the film is massive, with the Terminator becoming the hero of the film as he battles against a shape-shifting cyborg. It's big, loud, heartfelt, scary and utterly thrilling. A must. 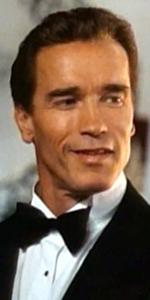 Compared to Terminator 2, the rest of Scwarzenegger's filmography is mere commentary; he did Last Action Hero (released in June, 1993), with F. Murray Abraham, for director Ivan Reitman, then starred in James Cameron's True Lies (which played the Chinese in July, 1994); Junior (released in November, 1994) with Danny DeVito, was a misfire with Arnold becoming the world's first pregmant man (! ), but that sort of thing never lasted long. Arnold returned to action pictures with Eraser (which played the Chinese in July, 1996). A fiasco for everyone was Batman & Robin (released in June, 1997) — you remeber — it's the one with George Clooney playing Batman. Lots of people went to see it. Not nearly enough people went to see End of Days (released in November, 1999),with Gabriel Byrne. Collateral Damage (released in February, 2002), with Elias Koteas, did well, as did Terminator 3: Rise of the Machines (which played the Chinese in July, 2003). Arnold assumed the office of Governor of California from November, 2003 to January, 2011 (not the first, and probably not the last actor to go into politics). While in office, he did a small role in Sylvester Stallone's The Expendanbles (released in August, 2010). Out of office, his part was expanded for The Expendables 2 (released in August, 2012). In October, 2012, his second autobiography, Total Recall, was published. Many stories of his days as the Governator are included. The Last Stand (released in January, 2013), with Johnny Knoxville, bombed, and so more-or-less did The Expendables 3 (released in August, 2014). Arnold did a guest role on Two and a Half Men aired over CBS in February, 2015, and appeared in the moderately successful Terminator Genisys (which played the Chinese in July, 2015). He has a truncatedly smallish role in Killing Gunther (released in September, 2017). Mann's Chinese Theatre, Hollywood, California. Arnold Schwarzenegger Forecourt ceremony, Thursday, July 14, 1994. 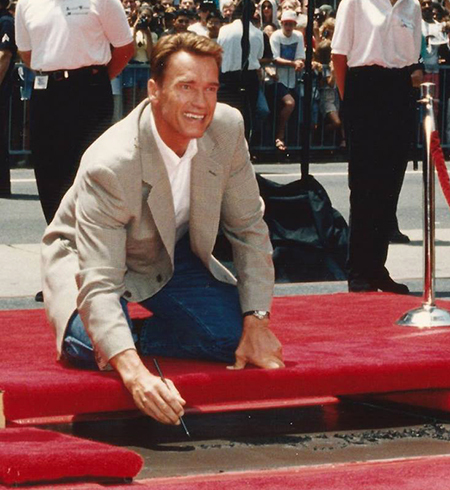 Arnold Schwarzenegger gives the cameras a grin while signing his name in the cement.